Actually a family of four (or five) switches with either 28 or 48 access ports and either SFP+ or Tw-pair. There is a fifth varient that includes fiber channel and 48 SFP+ access ports. Cumulusnetworks says in their hardware compatibility matrix that this is a Broadcom Maverick. 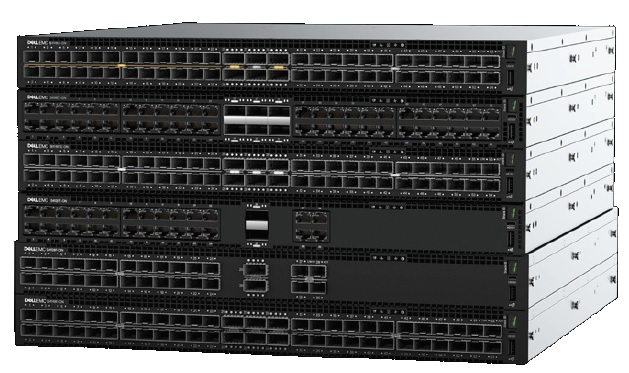 The Dell EMC switches use a common packet buffer that is shared across all ports of a given switch on a dynamic basis. These buffers can be used to prevent packet loss by buffering packets where an output port is momentarily oversubscribed. Tolly engineers determined that the port buffer capacity of each of the switches was eight MB. To saturate the switch port buffers, engineers configured Ixia to provide one line-rate traffic stream destined for a single port. Engineers created a separatge traffic burst destined to this fully-loaded port, and verified that after traffic was stopped, that all packets were received. Maverick has 12 MB of packet memory and 8 MB is available to absorb a single microburst. That tells us that Maverick is a single core design. Contrast with Tomahawk's four core design.